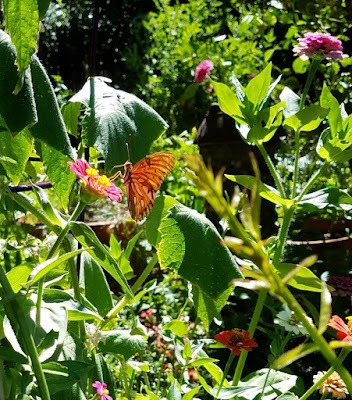 It's been a hot few weeks and the garden is in its usual summer bloom slowdown. This year I remembered to start some zinnias from seed and plant them out in various spots to try to brighten up the hotter days, some in the pots that have tomatoes and cucumbers in them. This Gulf Fritillary is one of many who hang around for the Passiflora caerulea in the side yard (not so much it seems for the sanguinolenta blooming further below) and it seems to find the zinnias a good addition. Salvias don't mind the heat, thank goodness, so there are several in bloom and Salvia Big Swing is one of the showiest with its bright blue flowers. 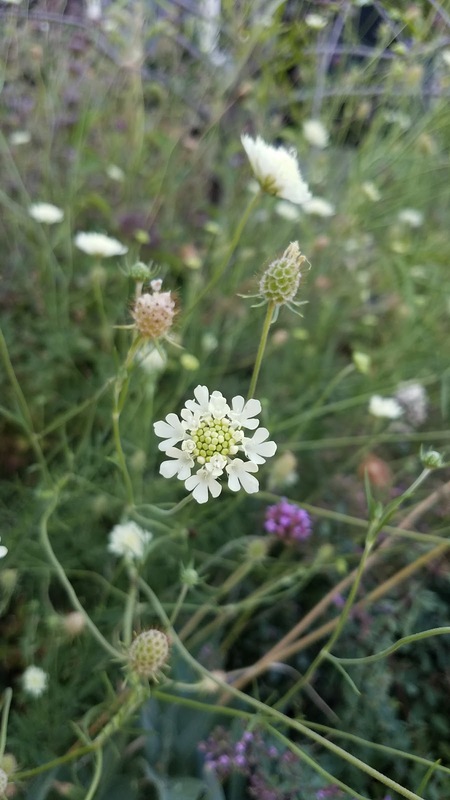 This is a favorite also because its blooms continue off and on almost all year in my Zone 9b garden. 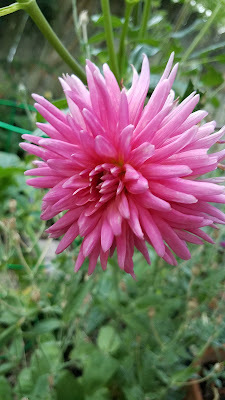 If you are a fan of Gardeners' World like I am you may be constantly tempted/teased/tormented by all the lovely dahlias. So, over the years I have tried them, given up on them, and tried them again. California's Central Valley and the English countryside have a few too many climate differences for them to look as lush here as they do there but, be that as it may, I am back in 'try them' mode. Lauren Michelle is one I try almost every time and it has just started blooming this year. 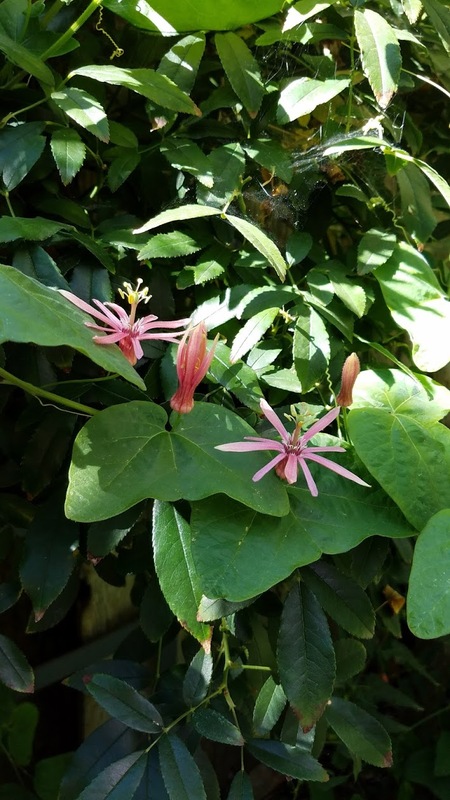 Here is that Passiflora sanguinolenta...sweet little blooms and a much tidier plant than the caerulea that wants to take over the world. My most successful scabiosa is Scabiosa ochroleuca...it has self seeded in abundance and I love the tall stems that move in any sort of breeze. 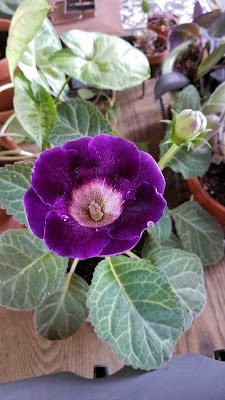 Gloxinia violacea is in a small pot and this year I decided it should try summering outside. Its first bloom opened just in time for Bloom Day! If you would like to see many more blooms from around the world click over to May Dreams Gardens where Carol has links to all sorts of beautiful blooms! I think I got 2 blooms on the 'Tutti Frutti' dahlia last year before it began its slow and ugly decline. 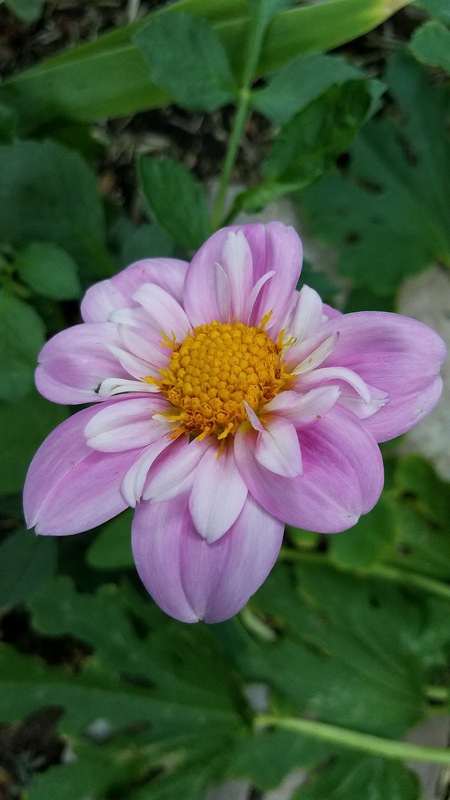 I bought 2 'Mystic Beauty' Dahlias in bloom from a local nursery and they lasted several months. I saved some tubers and we'll see if there's any life left in them come next spring. Tutti Frutti is alive in Tennessee, but chipmunk digging around the roots in early spring set it back. Used cat litter in the tunnels stopped the rascal critters but there are no blooms this year. Better luck next year. 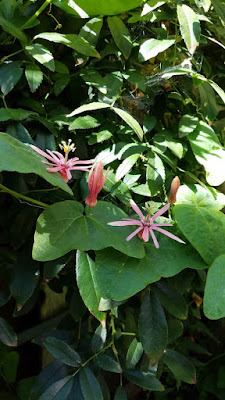 Love your passion flower! Thank you Dee! Cindy...you and I just don't have the right climate! Frances...that is a creative and amazing use of used cat litter! My Rhode Island Tutti Frutti succumbed to drought. It should have been better attended by the Head Gardener. 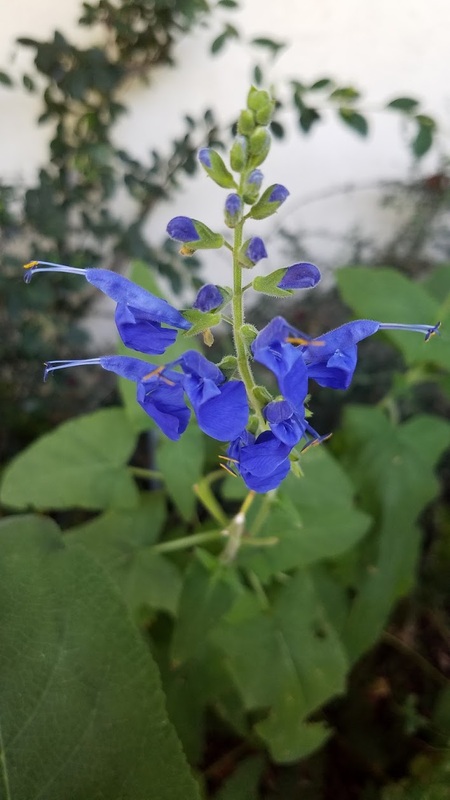 Love your blue salvia. All looks great!